Hartford, CT- In November of 2015 Senators Richard Blumenthal for Connecticut and Bill Nelson for Florida requested that the Consumer Product Safety Commission (CPSC) conduct an investigation on the safety of the crumb rubber infill typically used in athletic fields. In January of 2016, the city of Hartford included article 6.3.3 B in their zoning regulations stating that the use of artificial turf containing synthetic infill materials shall be prohibited. Safety concerns continued to escalate, prompting the same two senators to write a letter to then President Obama asking for the funding to commence a comprehensive, interagency federal study on the potential health risks of playing on artificial turf fields with crumb rubber. The funding was granted and the study involves cooperation between the Environmental Protection Agency, the Centers for Disease Control and the Consumer Product Safety Commission. The results of the federal study have yet to be published and thus far no public policy or health risk warning has been declared. Fast forward to now where Hartford’s own Weaver High School is installing a new sports field. Natural grass was considered for the new athletic field, but the school district knew it would be difficult to maintain given the state pesticide regulations. Artificial turf is the practical choice allowing year round use, but what infill would alleviate the concerns of parents and community and Senators? The clear choice was Greenplay’s plant-based, organic Corkonut® infill. Guaranteed to take the artificial turf to another level with grass-like performance, low abrasion, low field temperatures and minimal fly-out while promoting safety and an environmental stewardship with a 100% natural and recyclable product. The new state of the art turf field will be based on Sprinturf’s Ultrablade Dual Fiber Extreme turf with an industry exclusive fiber blend of 120-micron slit film and 330-micron monofilament fibers. Combining the turf with Greenplay® organic Corkonut infill provides the best possible scenario to alleviate any health or safety concerns in the community. Hartford HS will be following the successes of other schools in Connecticut, like Brunswick School and Convent of the Sacred Heart, both in Greenwich. Back in 2015 Brunswick School’s Cosby Field was replaced utilizing organic infill instead of crumb rubber at the insistence of many concerned parents. Following up recently with Brunswick School Headmaster, Thomas Philip, he states that three years on the infill is “Still holding-up wonderfully and playing great!” After admiring the success of the natural infill at the nearby Brunswick School field, Convent of the Sacred Heart in Greenwich was ready for their new turf fields last year. The use of Greenplay Corkonut infill was mandated from the get-go for the inherent performance and cooler turf temperatures witnessed first-hand. Greenplay® puts the nature back into turf for ultimate performance, safety and environmental responsibility. It is the perfect turf infill for all sports applications, recreational areas, playgrounds, landscapes and compatible for use with any turf that requires infill. It is successfully utilized nationally in over fifty fields with diverse regions and climates. Greenplay products are non-proprietary and available to the entire turf industry as well as the public. 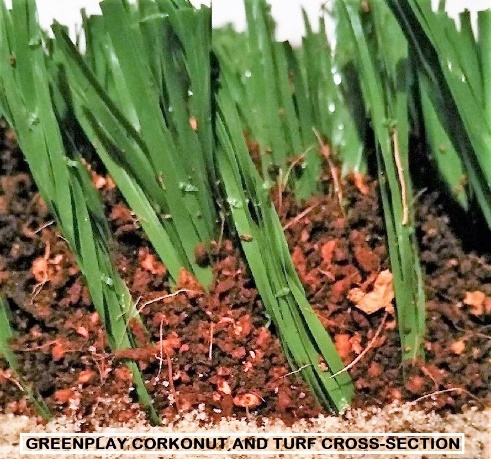 Founded by Domenic Carapella, Greenplay Organics is a US based company that developed Corkonut ® as a second generation organic infill from ten plus years of experience of working exclusively with organics. No company in North America has the depth of knowledge or passion for this type of product. Corkonut is tested against the best and is proven to be the most durable organic infill product available. With quality control as its top mandate, Greenplay Organics specifically sources materials from pesticide free crops and blends by utilizing proprietary natural processing methods. Quality, performance and durability are vertically integrated starting with the control of the raw materials through processing and direct distribution. For more information, visit www.greenplayusa.com or contact the office by phone at 516-223-0202. Greenplay Organics is proud to announce the new 10 acre Greenplay® organic infill artificial turf sports field complex at Greenwood Park in Virginia, scheduled for completion in February and featuring four full size fields designed to blend with the beauty of the natural environment, positioned at the center of the pristine 88 acre park.